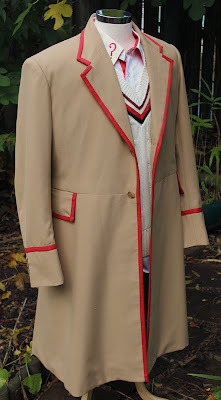 Making My 5th Doctor Costume: When is a Five Coat not a Five Coat? 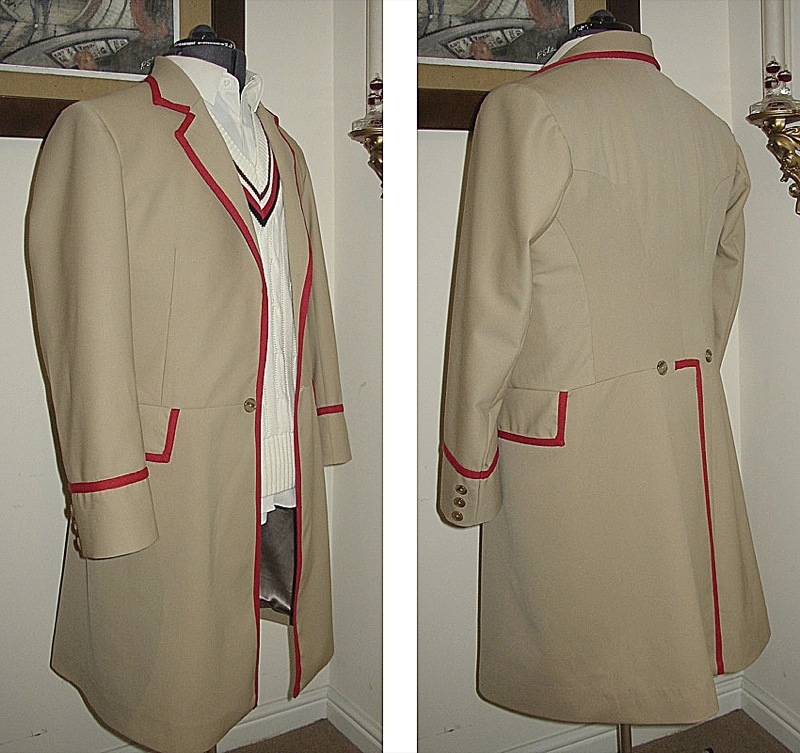 I have just finished a special commission for Ian Cummins, who has bought one of my Tennant Coats already. He has seen that I had done my replica Five Coat, and wanted one for himself – but to a specific brief. What he wanted was essentially an Victorian Frock Coat. The outer a dark brown, which we've already discussed and you've already procured. I just want something bright, vibrant, even a little clashing, something you would not expect to see inside a brown coat. Although I originally specified mustard, if you could have a scout round for other colours/textures, that would be fine. Even a bright green or purple, anything you find and think may fit the brief, as long as you let me have a look first! Just take a quick snap and email it over. 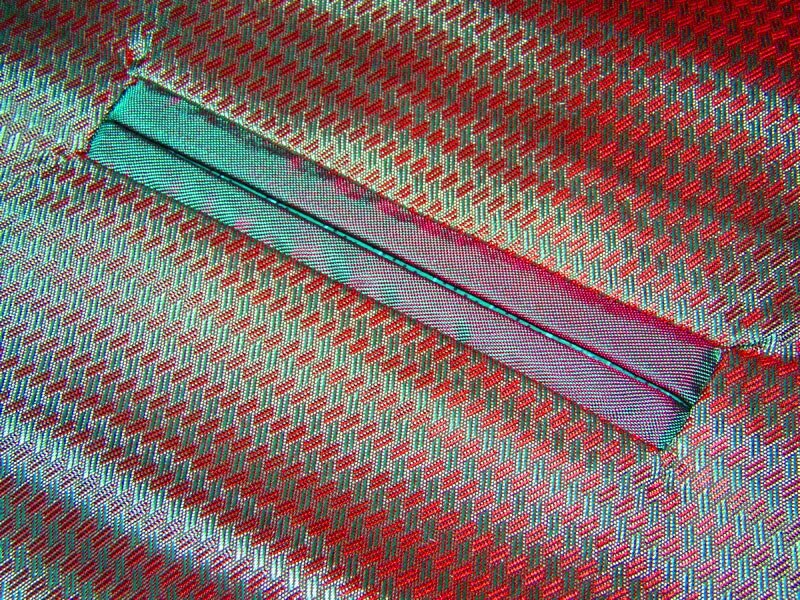 Self-striped or otherwise textured is fine, whatever you think would be good. If you want to incorporate anything different for the inside sleeves or pocket welts or rims, be my guest!! Of course the width of the outer side pockets is dependant on the accurate pattern you’ve designed. I’d like them to be deep enough to comfortably hold a DVD though, please. The four inner breast pockets, we’ve already discussed, but if they could be as large as is possible from a tailoring standpoint please. It’s okay if the two lower ones are smaller, whatever works. Just some nice horn/tortoise-shell buttons would be great. 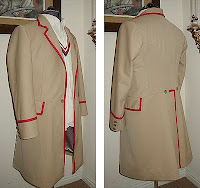 If you could place it somewhere a little more noticeable than on the Tennant coat, maybe on one of the inside pockets? I love that label! Whatever you and Bob have perfected I’m sure will be excellent. I just always wanted a coat of the same cut and shape as Davison’s. I don’t require any piping though (was never a great fan of that). So, I am to make this from a completely different fabric, preferably in a dark brown wool. I took a look through some fabric shops I know in Goldhawk Road, but there wasn’t anything suitable. Then during one of my buying trips to Soho I went into what has become one of my favourite shops, Textile King (see left). 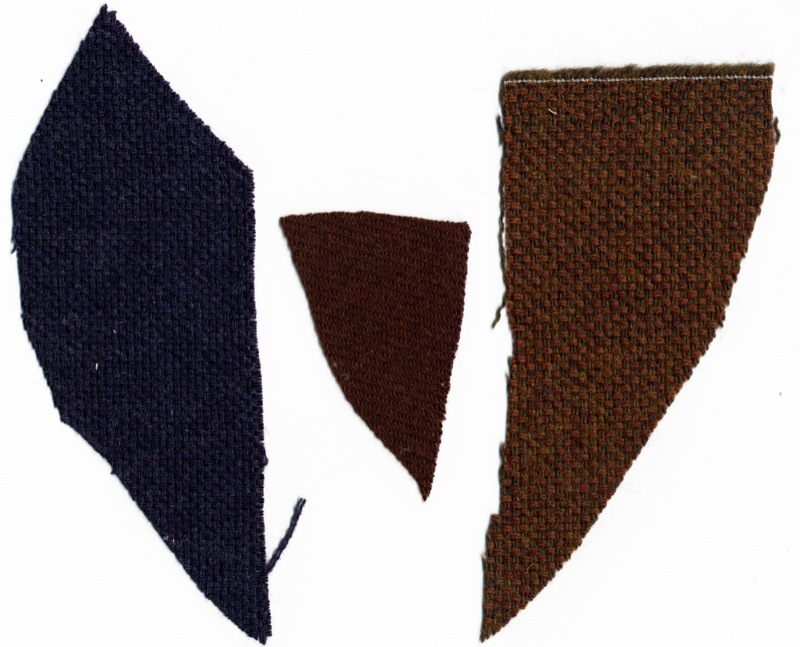 It was in here I found two possible brown fabrics: one with a heavy twill; the other with coarse weave; as well as a colourway of the latter in dark blue as an option (see right). Ian was very happy with the brown twilled sample, so that was easy! It was nice to have a free hand on this occasion. Instead of trying to find the most perfect match to a specific lining fabric, to just go looking and find something truly striking and eye catching was quite liberating. Initially I found a pair of iridescent red/green fabrics, again from Textile King, and I produced a couple of test for Ian to see (see left), which you may have read about under Five Coat - The Time Lord’s Pockets. My replacement was a plain gold coloured satin, which I accented with a beautiful Chinese-style emerald green, with a self-woven floral design and a grey/silver self-woven paisley. I’ll show you how this will be used later. Ian has requested four inside pockets, which is a challenge as I will need to stack them in such a way they do not interfere with each other too much, but sufficiently close together to work aesthetically as well as practically. Having said that, the new techniques I used to do fine welts on the Five Coat will get a nice testing here! The buttons proved to be more of a nightmare than I first thought. My main problem is to find a button that will work, but I also need to have them in two sizes: larger ones for the front and back; and much smaller ones to go on the sleeve cuffs. To start with I followed the brief of horn-style in brown, but had difficulty finding anything that I thought would work. I dabbled with using the buttons from the Ten Coats I do, both the original ones and the newer, more screen accurate ones I use now (see right). But they just did not work for me. After a further search of the Soho fabric shops, I did buy a set of moulded brown buttons in Klein’s (see left). They reminded me of some I had seen on one of the costumes at the Bonhams auctions – but as soon as I got them home I knew they were wrong too: they just looked cheap. I then wondered if horn was really the best option here after all, and thought that a metal button of some sort could possible work better, as it would tie-in with the gold lining. Looking around the Soho fabric shops yet again I found quite a range (see right), but nothing that fitted the bill to my satisfaction, or in the two sizes I need. 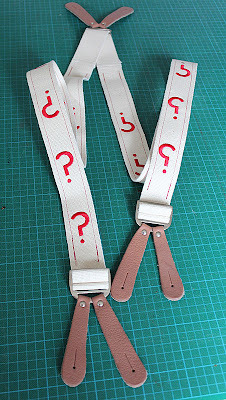 Having given up, I returned home and had a brainwave to try eBay of all places. It was there that I discovered some Italian-made metal buttons with a detailed filagree design on them, in both the sizes I needed (see left). They were available as a BuyItNow, so I snapped them up and the seller had them shipped to me within 24 hours and I had them the very next day. They were perfect – result! Ian had already owned a number of frock coats, to varying satisfaction. 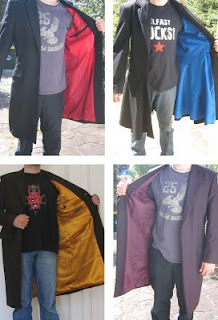 A local tailor had made him one a few years back, but it had design and drape issues, as did a more recent one from a leading internet costume maker. Despite returning it a number of times the problems weren’t resolved, so he commissioned me instead. For me the main design-lines to pay special attention to are the curved seams on the back and how close they are at the waistline; and to make sure the waist is tailored in enough to give the lower part of the coat a flare to it. I had already made particular note to include all these in my pattern for the Five Coat. Check back soon to see how the coat turned out – I think you’ll be surprised!